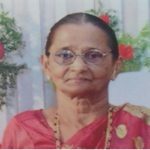 Funeral cortege leaves residence ‘Dsouza Compound’ Gundyadka , on Monday March 6th to Our Lady Of Lourdes Church, Kanajar at 3.30 pm followed by mass at. 4.00 pm. Eternal rest grant unto her oh lord may her soul rest in peace…. My heart felt condolence. May her soul rest in peace. Dear Borji Bappu, Victor, Vincent, Valerian, Jecintha, Anitha and entire Family members please accept my Heartfelt Condolences. May the Perpetual light shine upon Lilly Mausi ‘s Soul. May her Soul Rest in Peace Amen. I felt very sorry that within short period of time she left all of us. She was like mother to me. I Really miss her. Our heartfelt condolences to the bereaved family. May the Almighty God give them courage and strength to bear the loss. May her soul rest in eternal peace. Heartfelt sympathies to Bappu & fly.. May the Lord be with u at this moment of grief & give u strength & courage to bear the loss of ur beloved one.. Praying for u all, May she rest in peace amen.